I’ve always been a fan of Alice In Wonderland and I find a bit of whimsy in looking at things through the distortion of the bottom’s of bottles of all sorts, especially wine bottles with their really curvy bottoms. 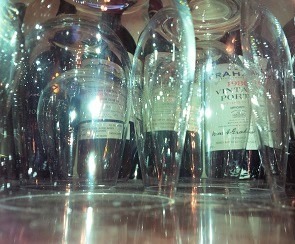 Today as I put away a few of my everyday wine glasses after a rather enjoyable evening, I saw a wondrous distortion of some of my open bottles of Port. So I am going to impose on you by sharing my crazy vision and asking your opinion. Initially I took the photo in color photo, but the more I looked at it I wondered about the starkness of the image in a pure black and white format. So I decided to publish it both ways and let you decide which you liked best, the stark and chilly or the colorful and warm. Voting is by reply or if you really don’t have an opinion or think I am as warped as I feel sometime when I see beyond the first layer of what’s in front of me, just ignore this post and I won’t be offended. That said I really hope you enjoy contemplating the differences and their impact on your senses as I did. 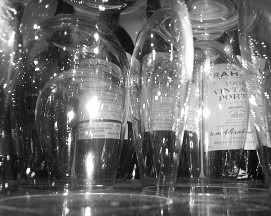 This entry was posted in Hodgpodge, Life Balance, Port, Whimsy, Wine Glasses, Wine Photos and tagged Distortion, Hodgepodge, Life Balance, Modern World, Port, Whimsy, Wine Glasses. Bookmark the permalink. Good eye, Robert – I scrolled back and forth several times and decided I really couldn’t come to a firm preference, but leaning toward the BW. I’d love to see either/both in full res! The full res might influence me the other way. But who says you should only have one? One of my art pieces is looking out the gorgeous double doors of the CIA outside Napa. I offer it BW & color. Different ‘feels’. I am putting you as undecided so the count is now 5 to 3 favoring the Color, with no gender impact noted. Color on this one. I used to like all color, then came to appreciate b/w, and am now actually an antique dealer in vintage b/w images so love them, but the color is light, blue, and a bit psychedelic, so have to go with that. Well it is now 4.5 to 2.5 and until now all the color votes came from women. So much for my theory that Women are different from Men. You make it 3.5 to 2.5 for the Color. I find that very interesting, women are going for the color and men for the Black and White. Does this tell us anything except that Women and Men are different? I’m tempted to hark back to the 70s and say, “Groovy, Man!” These are quite wonderful images. If the black and white had more contrast, I’m fairly certain my eyes would love it best, but the web doesn’t always give us the sharpest view. Of these two, in the format I see them, I prefer the subtle tinge of electricity in the colored one. Thanks, for now it’s 2 1/2 to one for the color. As to the contrast, I am sure it is a combination of the camera, the photographer and e-distortion, as they look much better on the camera screen than they do on the site. Mine always look better on camera as well. By the time I reduce the file size for web, they degrade a bit. I like the aqua color to the glasses in the color photograph, so that one gets my vote. The color photo made me instantly think of Christmas, while the black and white took me back in time and carried with it a very peaceful and reflective feeling. Does that mean I like them both? I’ll put you down for a half each. I like the aqua color of the glasses in the color photo, so that gets my vote.